Souvenir Press, London, 1974; ISBN 0-285-62129-7. 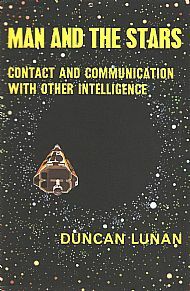 US hardback “Interstellar Contact”, without colour plates, Henry Regnery Co. 1974. French paperback and hardback collector’s edition, without colour plates, “À L’Écoute des Galaxies”, Robert Laffont, Paris, 1976. Spanish paperback, without colour plates, “A La Escuchia de las Estrellas”, Liberia Editorial Argos S.A., Barcelona, 1977. US paperback, without colour plates, “The Mysterious Signals from Outer Space”, Bantam, 1977. UK paperback, without colour plates, “Man and the Stars”, Corgi 1978. Greek paperback with black and white plates,1979. “Man and the Stars” was based on a discussion project which I ran within ASTRA, the Association in Scotland to Research into Astronautics, in 1967-73. At first the topic was to be 'The first phase of interstellar colonisation, out to 12 light-years'. That became Part 1 of "Man and the Stars" and we later extended it with a Part 2 on Contact with Other Intelligence. Those discussions wound up in the summer of 1973 for publication by Souvenir Press in 1974. The main ideas for Part 1 of the Interstellar Project were worked out by Ed Buckley and myself, and the speakers we initially approached were the late Dr. Archie Roy, then Senior Lecturer and later Professor of Astronomy at Glasgow University; the late Terence Nonweiler, Professor of Aerodynamics and Fluid Mechanics; the late John Macvey, author and amateur astronomer; Andy Nimmo and the late John Braithwaite; the late Oscar Schwiglhofer, founder of ASTRA; and finally, in that phase, John Bell of the Glasgow SF Circle took the opposing view in a debate on 'The Case against Space Travel'. We first intended each of them to contribute guest chapters, but it proved impracticable. Pat McNally contributed a lot and Brian Gardiner of the British Antarctic Survey had a big input to it, along with the late David Proffitt, RN, and others. At the first Interstellar meeting, Archie Roy showed us that Earthlike planets in other planetary systems could be identified from here, so the colonists would know where they were going. That very much changed the whole concept of the mission. And John Macvey drew our attention to the mystery of long-delayed radio echoes, which later started the ‘space probe affair’ and eventually made the book a best seller. At the second meeting, Terence Nonweiler gave us a masterful breakdown of the possibilities for interstellar propulsion and for landing on Earthlike worlds – he mentioned Waverider, though its full significance wasn’t then apparent. But now we had a much clearer idea of what a foreseeable interstellar programme might be and Ed Buckley was beginning to produce draft artwork, starting with a set of small watercolours. Then John Macvey’s talk raised serious questions about whether such a colony group could survive on an Earthlike world, and Andy Nimmo said, “No, it’s just no good”. He laid down what would constitute a politically acceptable programme, and it couldn’t be done without faster-than-light propulsion. A lot of the ASTRA members at the time just couldn’t take that and bailed out of the project but the rest of us went on. We know now, of course, that by putting together Gerard O’Neill’s concept and the British Interplanetary Society’s Project Daedalus, we can achieve interstellar travel without having to break the laws of physics, and the ‘mobile world’ concept was the biggest change between “Man and the Stars” and “Man and the Planets”. The big influence on Part 2 was the late Chris Boyce, who opened it with a guest chapter and originally was going to write the whole of it. Bill Ramsay, Jim Campbell, John Kelk and Joyce Mains took active part in the Part 2 discussions and Gavin Roberts had emerged by then as the second artist on the project even while still at school, with a big input to it like Ed Buckley's. He did the cover for “Man and the Stars” and later for “Man and the Planets”. In Part 1 we had concentrated on life-bearing planets, without intelligent life, as possible colony sites. It wasn’t of interest to publishers on its own, and after the von Däniken books became best-sellers, we thought we’d like to run a serious investigation on whether Earth had been visited. To do that, we had to work out what to look for, and to do that, we decided to begin Part 2a with how we should behave when we went looking deliberately for Other Intelligences. Then we turned it around to what we should expect and how we should react if ‘they find us’. Then, and only then, we started work on the supposed historical evidence to see if any of it looked plausible. Once again, we did a lot of original work and I was disappointed that it had no effect in the field: subsequent books continued to say “nobody has given any thought to this” or “nothing can be said about that” where we had a detailed structure of possible scenarios. Chris Boyce developed the ideas of his guest chapter into his own book “Extraterrestrial Encounter” (David & Charles, 1979), in which I had a guest chapter in turn. Chris cut out some material which didn’t fit his main theme and I published that in Second Look in 1979. In 1987 I was the only amateur speaker to address an IBM Heathrow Conference during their nine-year run; that year’s theme was ‘Science and Paradox’ and I spoke on the Fermi Paradox, and a paper combining the two previous ones was published in Speculations in Science & Technology, January 1988. I updated it when Jamie MacLean and I were editing ASTRA’s journal Asgard and that version was published in September 2002. At the first meeting of the Interstellar Project John Macvey had brought up the idea of Prof. Ron Bracewell, of Stanford University, that a probe from another civilisation might have tried to contact us by radio in the 1920s and been responsible for the effect called ‘long-delayed radio echoes’ (LDE). James Strong of the British Interplanetary Society had suggested that such a probe might be located at the L4 or L5 point in the orbit of the Moon (not ‘in orbit round the Moon’, as the press was later to insist). Research begun by the late George Sassoon later confirmed that the major source of LDE was indeed the L5 point, with a possible repeater at L4. I followed up the lead John Macvey had given me and looked up the original papers on LDE, published in Nature in the late 1920s. At first sight the variations in echo time looked random. However, Bracewell had suggested that the first message from a probe might be a TV image of a constellation, and it occurred to me that a set of star map coordinates would be a random series of numbers. When I tried graphing the signals to see if that would work, to my astonishment I found what appeared to be a readable message, giving Epsilon Boötis (Izar) as the origin star of the spacecraft, and its arrival date as 11,000 BC. I thought that I would have to translate all the LDE patterns before anyone would take that seriously, and I worked out translations for a much longer series of LDE received in 1929, before I submitted my paper to the British Interplanetary Society. It was refereed by the late A.T. Lawton, who mentioned it in a lecture in December 1972 and provided the Sunday Telegraph with a front-page scoop. It made national news overnight and then was eclipsed on Christmas Eve by the terrible earthquake in Nicaragua. The subsequent evolution of the story in the media would be worthy of Gilbert and Sullivan: for example, a completely accurate account of it appeared in the US National Enquirer, whereas Time magazine got it wrong and never printed a promised correction, but is the one most often cited to this day. The actual paper was published by the BIS as 'Space Probe from Epsilon Boötis', in Spaceflight, April 1973. It became apparent that some of the 1920s records I had worked on weren’t accurate, and that facts I had deduced about the Epsilon Boötis system were incorrect, so I withdrew the translation. ('Long-Delayed Echoes and the Extraterrestrial Hypothesis', Journal of the Society of Electronic and Radio Technicians, September 1976.) By that time Lawton had published his own natural explanation for LDE, which I have never accepted but was widely accepted as a refutation. “Man and the Stars” came out in 1974 and I was then contacted by two very talented people, Alan Evans and Jamie Bentley, both of whom liked my approach to the possibility of past contact with extraterrestrials, and proposed a search for evidence to prove it, if it had happened. In the course of our enquiry Epsilon Boötis came up again, apparently as a time marker rather than indicating the origin of the visitors. We think that we have strong circumstantial evidence for at least one visit to Earth, in the period 3000-2500 BC: this was published as ‘Epsilon Boötis Revisited’, Analog, March 1998. Two years earlier Analog had published my separate research into the mediaeval mystery of the Green Children of Woolpit, which if true, appears to be ‘the X-files in the 12th century’. After I returned the proofs of ‘Epsilon Boötis Revisited’ to Analog it occurred to me that there could be similar circumstantial evidence for that in positional astronomy: Alan Evans confirmed that there was. At that point all three enquiries, into long-delayed radio echoes in the 1920s, ancient positional astronomy at Stonehenge and the Pyramids, and a very human mystery in 12th century England, become different aspects of a single enquiry into Past Contact. I’ve published my own speculative interpretation in “Children from the Sky”, but it really does appear that we’re on to something big. Black Knight – nothing to do with me. Unfortunately much media interest and numerous websites print only spurious stories about me, building on the misreporting of the Epsilon Boötis story in the 1970s. For the record, I am not a professional astronomer, I am not a radio amateur, I am not a professor and have never been a staff member of Glasgow University. I was not alive in the 1920s, was not born until 1945, and I have never heard of any ‘voices’ supposedly heard by astronaut Gordon Cooper in orbit in 1963. As for ‘Black Knight’, the only real one I know of is the British sounding rocket used in the late 1950s for upper altitude research and missile warhead development in the late 1950s, afterwards developed into the Black Arrow which put Britain’s one and only independent satellite into orbit in October 1971. For its story see “A Vertical Empire” by C.N. Hill, Imperial College Press, 2001, and “Black Knight, Britain’s First Ballistic Rocket” by C.N. Hill, British Rocketry Oral History Programme, 2007. In the 1950s Clyde Tombaugh, discoverer of Pluto, supposedly discovered a previously unknown satellite of the Earth. Tombaugh did conduct a search for natural satellites of the Earth in the early 1950s using Baker-Nunn tracking cameras, which were the most advanced of their day. The conclusion was that apart from the Moon, there was nothing orbiting the Earth which was baseball-sized or bigger. Tombaugh confirmed that to Patrick Moore in person. (Patrick Moore, “On the Moon”, Cassell, London, 2001). If it had existed, it would have been much closer to us than the L1 point between Earth and Moon, very much closer than the possible Bracewell probe at L5. The L4 and L5 points, also called the Equilateral or Trojan points, are equidistant from the Earth and Moon, and as far away as the Moon itself. In UFO literature the issue is compounded by stories about a mystery satellite found in polar orbit in 1961 and supposedly designated 'Black Knight', though I never heard the name at the time. A second satellite was discovered in a similar orbit, but both were soon identified. The Discoverer satellites, later renamed ‘Corona’, were spy satellites orbited by the USA between 1959 and 1972, returning their film to Earth by parachute. The search for one such payload is the ‘MacGuffin’ behind Alistair MacLean’s Ice Station Zebra, which was inspired by an actual search for one which came down off Spitsbergen In December 2012, a release of previously classified documents revealed that another was lost in the Pacific near Hawaii in 1971, and recovered in 1972 using the submersible Trieste 2. The capsule had separated from the parachute during descent and broken up, so the recovered film was unusable. (The Times, ‘How US Searched for Film that Fell to Earth’, reprinted The Australian, 27 December 2012.) In 1959 and 1961, the Discoverer 5 and Discoverer 23 capsules ended up in near-polar orbit between 600 and 1000 miles up higher orbit, instead of returning to Earth, because the retrorockets fired in the wrong position. (J.W.R. Taylor & Maurice Allward, “Satellites and Space Travel”, Ian Allan ABC, 1960; Kenneth Gatland, “Spacecraft and Boosters”, Iliffe, 1964). It took time to find them but there was no doubt about what they were. Nevertheless it’s now claimed on numerous websites, without asking me, that I translated signals from ‘Black Knight’ and that it was the Bracewell probe, although the decade is wrong, if Bracewell’s probe existed that was 240,000 miles away in the orbit of the Moon, and the ‘lost’ Discoverer capsules and ‘Black Knight’ were at 1000 miles up or less. None of it has anything to do with Clyde Tombaugh, or with me. I’m often asked if I intend to write a sequel to “Man and the Stars”, and a book entitled “Search Among the Stars” is in the planning stage, with published articles in Analog, Speculations in Science & Technology, RILKO Journal and others which would serve as chapter first drafts. A synopsis is available and s it says on the home page, enquiries from interested publishers will be answered promptly and enthusiastically.